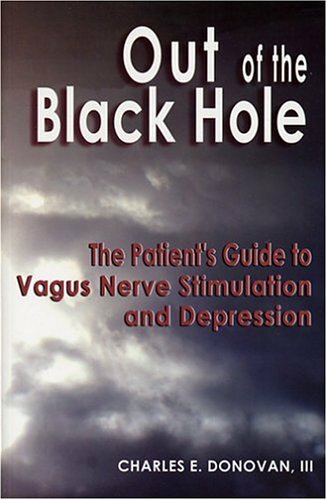 This is remarkable story of one man's journey out of the black hole of depression thanks to the remarkable medical breakthrough therapy of vagus nerve stimulation. This is now an FDA-approved treatment option for chronic or treatment-resistant depression. A prescription for this therapy is required from the patient's psychiatrist. On July 15, 2005, the U.S. Food and Drug Administration(FDA) approved vagus nerve stimulation therapy as a treatment for chronic or recurrent treatment-resistant depression. This is a therapy for patients that do not get adequate relief from the life-threatening, debilitating disease of depression. The author was a study patient in the FDA clinical trial of vagus nerve stimulation and depression. He was a presenter at the FDA's Medical Devices Panel Meeting in Washington, D.C. The book includes an easy-to-undertand description of the implant surgery, pictures of the procedure, the stimulator and the healed scars. Also included is information about the side effects and benefits (no cognitive impairment or drug interactions), things to consider while deciding to have the procedure, insurance codes and the reimbursement process. There's a special chapter devoted to the latest research about the biological disease of depression from the American Psychiatric Association's Annual Meeting in 2004. This book is an invaluable resource for any patient( and their loved ones) who are considering vagus nerve stimulation therapy to treat the debilitating disease of depression. Published by Wellness Publishers, L.L.C.